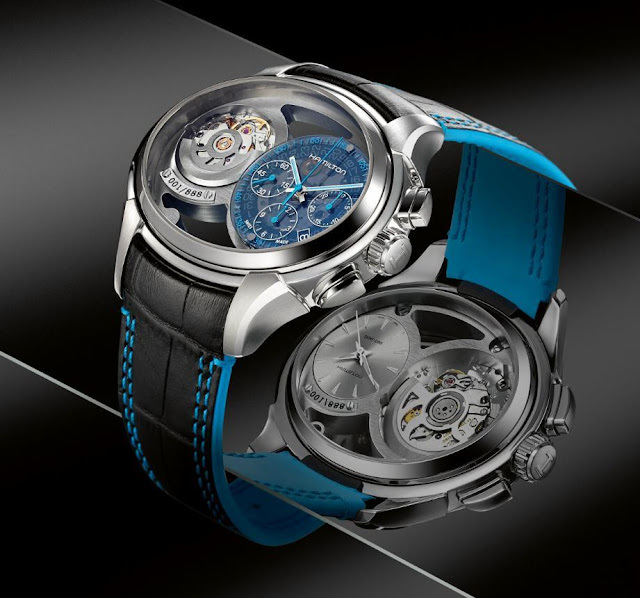 House of Swatch brand the hitoric American watchmaker Hamilton has released a new novelty in time for Baselworld 2013. Called the Hamilton Jazzmaster Face2Face, the 53mm watch can be flipped open to showcase two completely independent watch dials. The Jazzmaster Face2Face comes equipped with not one but two Swiss automatic movements, the first movement powered by an ETA 2094 is paired with a semi-transparent dial that showcases the date disc and a chronograph function with central indicators. The simpler movement is equipped with an ETA 2671 movement that depicts only time. The watch comes with a sapphire crystal case at the front and back to allow both dials and movements to be clearly visible. The watch works via a unique rotating case presenting two quite different faces. One a chronograph, the other an elegant three-hander. The link between the two faces are the skeletonised rotors of each automatic movement, fully visible in the oval-shaped case. Each individual watch incorporates two wearing options, to suit the mood or the occasion. Of course the two faces can each be set to different times zones. The Jazzmaster Face2Face comes on a black leather strap with blue stitching, the watch is released in an auspiciously limited edition of 888 pieces that will retail for a price of USD $6,550.